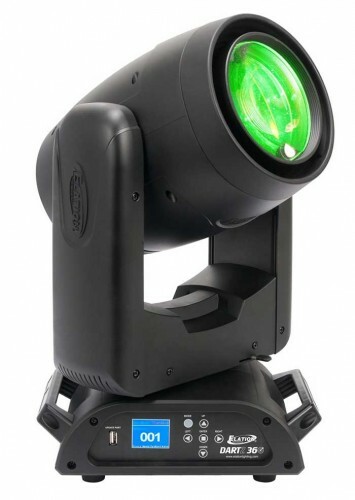 Elation Professional is offering the DARTZ 360, a unique LED beam/spot fixture that offers new projection possibilities from a compact, narrow-beam luminaire. The DARTZ 360 is the first RGB source beam/spot to combine such a high level of output with smooth colour-mixing, gobos, effects and sharp optics in such a small package. A single-source 50W RGB LED engine produces a powerful and tight three-degree beam for smooth, colour-mixed beam effects similar to a discharge lamp. Output is an amazing 29,000 Lux at 5metres. That’s more lumens per watt than similar products on the market. Extremely bright for its wattage and size, the combined LED engine source/optics package not only provides brighter output than previous multi-chip LED “beam” solutions, the field of light is also noticeably more homogeneous. Safe to use at any distance, the DARTZ 360 is ideal for use in smaller clubs and at smaller events. The smooth, full spectrum colour output combines with fourteen fixed gobos and effects to produce perfectly colour-mixed beam or image projections. With remote focus for a perfectly smooth colour-mixed beam, the light quality is exceptional. This focusable beam effect is similar to a discharge lamp source but in a fixture that offers full LED colour mixing with an extremely flat field of light and gobo and projection effects. The DARTZ 360’s effects package also includes six- and eight-facet independent rotating prisms, which can be overlaid to create new morphing effects. A linear frost filter is also included that softens the beam when a wash effect is needed. The DARTZ 360 is compact and phenomenally fast with lightning-quick motors and continuous 360° pan and tilt movement that adds an intense level of energy to any size show. A high speed electronic shutter and strobe are also included. Dimming of the LED engine is smooth and stepless from 100 to 0 percent and the unit includes five dimmer curve modes to suit any specific application. When used with cameras, the fixture works absolutely flicker-free thanks to its user-adjustable LED refresh rate and Gamma brightness settings. Standard DMX controllable and RDM ready, the DARTZ 360 can also operate via Art-Net, Kling-Net and sCAN protocol. Users can pixel map multiple units via Art-Net, easily adding into matrix displays the added features of beams and effects. The DARTZ 360 features a full-colour LCD menu display with a multi-button touch control panel that is 180-degree reversible. Professional grade 5pin XLR, RJ45 etherCON, PowerCON TRUE1 in/out connections are included as is a multi-voltage universal auto switching power supply. The DARTZ 360 can also receive wireless DMX via the integrated Elation E-FLY system.